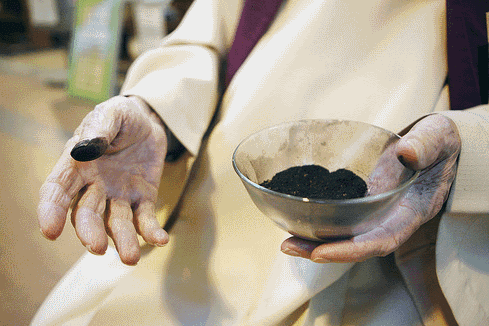 The texts for Ash Wednesday are the same for all three years of the lectionary cycle. 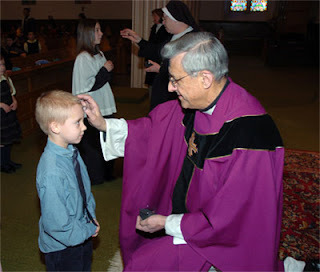 Go to Year A - Ash Wednesday to explore how children understand and respond to this day and to find the majority of suggestions for this day. Below are some additional ideas. U Because children are fascinated by the ashes, take time to introduce them. Jan Richardson offers this introduction for adults. They are a curious thing, ashes; they are terrible and remarkable by turns. Ashes come as a reminder of the ways that humans across history have been horrible to one another, of how we have, with an awful finesse, reduced to literal ashes one another’s homes, buildings, cities, histories, and very bodies. Ashes can also be a thing of wonder. This day in the Christian year, this day of ashes, tells us that ashes—dust, dirt, earth—are the stuff from which we have been made, and to which we will return. This day, and the season it heralds, seeks to ground us, to make us mindful of the humus, the humility, the earthiness of which our bones and flesh are made. And yet, in the midst of this, the season calls us to open ourselves to the God who brings life from ashes, who works wonders amid destruction, who cries out and grieves in the presence of devastation and terror, and who breathes God’s own spirit into the rubble. It is this God who breathes into us, calling our awful and glorious ash-strewn selves to speak words of life and freedom and healing amid violence and pain. Like Sojourner. Like Jesus. For children this means that ashes remind us of all the horrible things we do to hurt each other. They look like burned buildings. They remind us of all the war pictures we see. And, they remind us of all the ways we make war on each other every day with hitting, name-calling, telling lies about others, and so much more. Write some of these words on a piece of white paper with a finger dipped in the ashes. Try to erase it making a smudgy mess and note that once we start doing those things it is almost impossible to get them cleaned up. It’s a real mess. It leaves its mark on each one of us. Only God can get us out of our mess. On this day we wear ashes to admit that we are messed up sinners, but we make those ashes in the shape of a cross to remind ourselves that God loves and works with us to do better no matter how we mess up. Avoid the temptation to turn this into an object lesson about sin and forgiveness. Children will not follow you. Instead leave it as a meditation on how messy we and our sins are. U Create a responsive prayer of confession with the leader offering confessions of sin and the congregation responding to each “Forgive us our sins/trespasses/debts” from the Lord’s Prayer. Before praying point out the response and its place in the Lord’s Prayer which we pray every week. Include confessions about sins children will recognize near the beginning of the prayer e.g. God, we can be really mean to each other. Even when we don’t plan to we say unkind words, we call people nasty names, we hit, we hurt. God we want to always tell the truth, but we don’t. When we are caught in something that will get us in trouble, we lie. When we want to pass a test, it is easy to cheat. When we get mad at a friend, we tell awful lies about them. U Give children and all worshipers a simple prayer to pray as they wash their face at the end of the day. good blog design by Watermark template. Powered by Blogger. One thing that I always do on Ash Wed. is have a special Children's Time when we talk about the ashes. I always tell the children that the ashes were made by burning last year's palms. And I touch them, and tell them that they are not hot, and they do not hurt. I was surprised by how many children thought that ashes would be hot, and would therefore refuse to participate. I'd never tumbled to that. But it surely makes sense. So, I took the liberty to reprint your comment on the facebook page where more people will see it before Wednesday. Thank you.